Fab shop’s massive 1500-ton press brake gives customers freedom to “design big” with Hardox® steel. 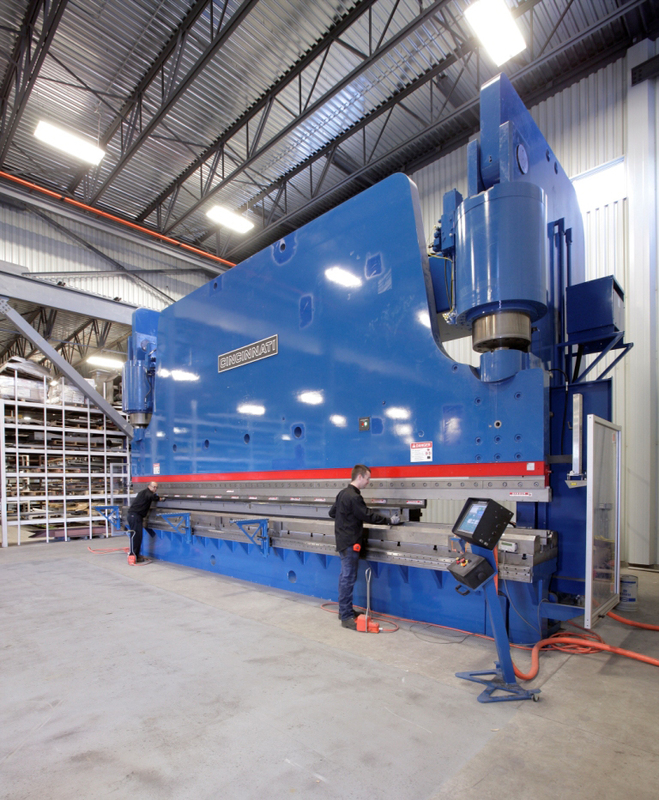 Canadian fabricator uses 30-ft. (9.2 m) Proform press brake to bend 15-foot long, one-inch thick Hardox® for mining, transportation and architectural parts, even meeting a tolerance of less than ± 0.03” (0.8 mm) on a custom bend project. Bending Hardox® 450 is not for the ordinary shop press brake, and when an overhead crane is loading 7.5-ton plates for bending, you know you are in the big (part) leagues. Quebec’s Metal Bernard acquired one of the largest CNC press brakes in Canada, a 1500-ton Cincinnati Incorporated Proform, to get into the big league of forming high-tensile steel and the machine has become a shop workhorse, bending the toughest steel plate as well as handling long-part bending on a variety of lighter gage steels and other metals. 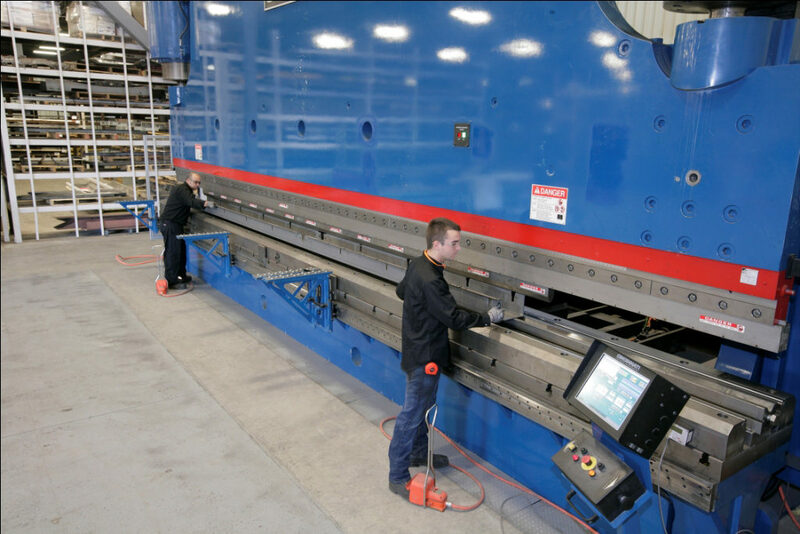 The large-part fabrication shop is using the 30-foot (9.2 m) press brake to bend high-tolerance – less than ± 0.03” (0.8 mm) in one case – large parts for the mining, transportation, energy, and automotive industries. The company is also taking advantage of the machine’s accuracy, and maximizing its productivity, for less intense bending, using it to fabricate 16-ga. stainless steel walls and other long, mild steel parts, as well as aluminum. Metal Bernard typically bends “one’s,” “two’s” and small batch parts, so quick setups and machine versatility, both attributes of the Proform, are critical to productivity. Metal Bernard bends Hardox, known for its durability and resistance to abrasion, into parts for mining equipment, tanker truck and industrial equipment frames, bridge sections and sidewalls for rail cars. The company also fabricates structural components for automotive plants. The Proform’s rigid, heavyweight platform has a unique frame, machined and interlocked together, to minimize deflection and eliminate distortion or alignment issues common with welded or bolted frames. Its clevis-mounted hydraulic cylinders – also unique in the industry – use hardened piston rods to reduce wear and maintenance. The cylinders and the machine’s centerline loading confine operating stress within the main housings to eliminate cylinder misalignment at maximum loading. Metal Bernard’s machine-tool stable includes 11 smaller press brakes, with another four at its sister plant, Normandin, but this was its first Cincinnati machine. The company assists in various stages of part design, depending on the customer and the project. In addition to bending, operations at Metal Bernard include regular and extra large laser cutting, rolling and processing a variety of metals. 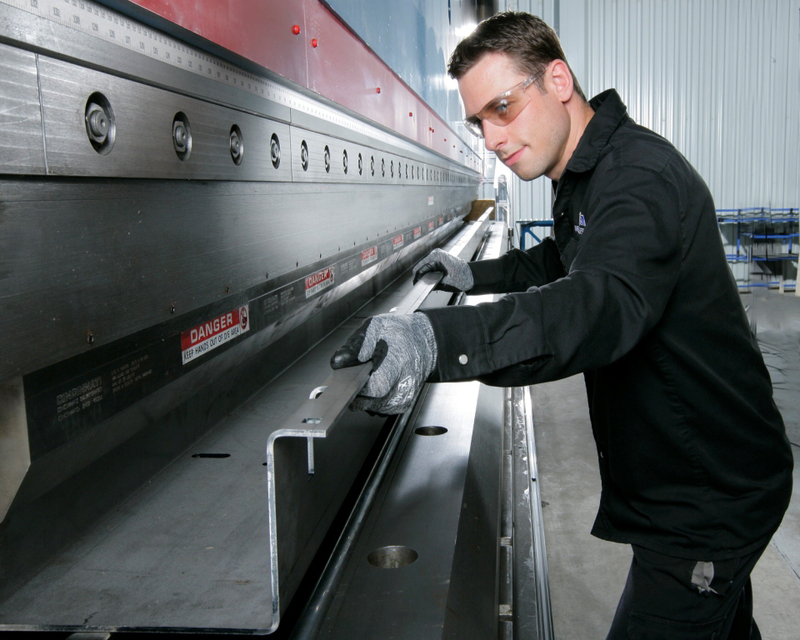 The press brakes, cutting equipment and other required machines are configured in cells on the shop floor. The lean shop runs three shifts, seven days a week and is known for quick delivery of quality parts. Bending Hardox 450 is tricky, Veilleux says. It requires greater force to bend, and can springback between 11° and 18°. For comparison, springback on mild steel is only about 2° to 4° degrees. The Proform’s control software features an “angle mode” that automatically calculates and applies adjustments for material springback. Angle mode uses the material thickness value and tool dimensions stored in the tool library to automatically calculate the ram reversal position. This enables easier material handling, faster setups and better first-bend results, without requiring operators to use trial and error to determine how deep the punch must penetrate the vee die to produce the desired angle after springback. According to Veilleux, due to the bending force required, cracking is also a concern, something that can be minimized by increasing the nose radius of the die. The Proform at Metal Bernard has a Quick Clamp ram nose that bolts directly to the ram, and the work surfaces are treated with Nitrex™ high-endurance surface enhancement, providing a hardness of 70-HRC with a maximum load capacity of 30 tons per sq. in. Surface hardness of the die is important for bending super hard materials like Hardox because the edges of the die opening must be as hard, or harder than the plate to prevent damage to the die. The press brake’s clamping system self-seats V-notched American-style upper tools, while standard tools without V-notches clamp without self-seating. The company also invested the time to thoroughly research the press brake that best met its needs, while ensuring a good ROI. Representatives from the company traveled around the world to see machines in seven countries over 15 days. For more information, visit www.e-ci.com.